Radiation portal monitors like these alarm less frequently on cargo materials such as tile or granite that may contain non-threatening, naturally occurring radioisotopes thanks to a new approach developed by PNNL, which emphasizes the use of selective energy-sensitive algorithms. RICHLAND, Wash. — Department of Homeland Security, Customs and Border Protection is improving radiation scanning equipment used at many of our nation's ports of entry. Radiation portal monitors now better detect radiological threats while alarming much less frequently on non-threatening materials, resulting in big savings. The improvements, known as Revised Operational Settings, are being implemented during the annual calibrations of radiation portal monitors used to detect radiological threats in cargo and conveyances entering the U.S. through official ports of entry. ROS will greatly improve CBP's operational efficiencies in keeping terrorists weapons out of the U.S., while facilitating lawful international trade and travel. Sponsored by and in partnership with CBP, the Department of Energy's Pacific Northwest National Laboratory has developed a method for optimizing the RPM settings that has now been implemented at the top 26 sea ports of entry, 16 critical land border crossings, and on all mobile RPMs. Implementations started in April 2014 and continue today. Alarm rates at seaports have dropped by an average of 78 percent and at land border crossings by an average of 44 percent. Alarm rate reductions on mobile RPMs are expected to average about 50 percent. These reductions amount to a decrease of over 230,000 RPM alarms per year, or more than 57,000 hours in processing time. This has allowed the redirection of over 88 CBP officers to other, high-priority enforcement duties at an annual cost equivalent value of over $10 million. Another $55 million in savings is expected over the next 10 years due to the reduced need for RPMs in secondary inspection locations used to confirm alarms generated in primary inspection lanes. Additionally, 70 percent of the locations where ROS has been implemented have reported safety improvements due to less congestion and better traffic flow. "As a CBP Business Transformational Initiative, the ROS project has been developed as a new approach to address the non-threat alarms produced by the Leidos cargo RPMs," stated CBP Office of Field Operations Assistant Commissioner Todd Owen, "The ROS Team worked on this project for approximately four years and the results of ROS have been transformational." 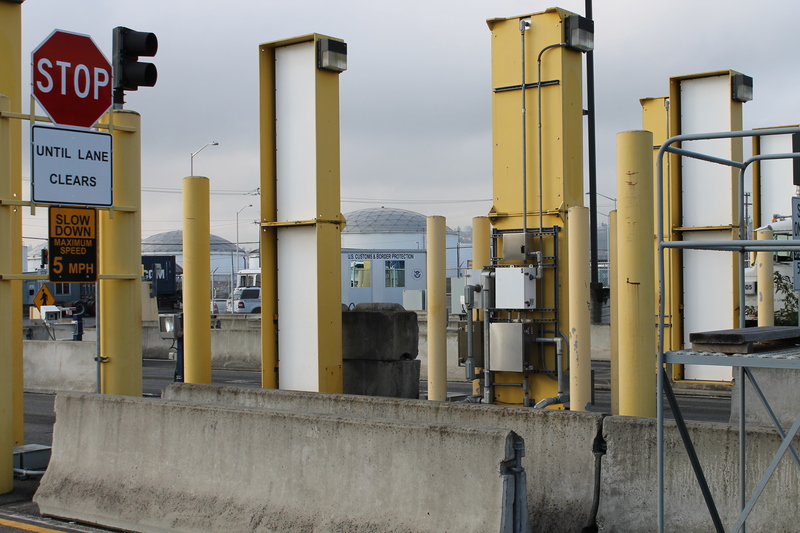 Radiation portal monitors were deployed by PNNL for CBP at ports of entry nationwide shortly after the terrorist attacks in September 2001. Currently about 1,300 radiation portal monitors are used to screen cargo, conveyances, bags, packages, and international mail for the illicit importation of radiological materials into the U.S. Radiation portal monitor nuisance alarms are caused when benign radiological materials in cargo pass through the RPM and generate an alert. For example, building materials like tile or granite may contain naturally occurring radioisotopes, such as uranium and thorium, and can trigger an alarm in these sensitive radiation detectors. Each nuisance alarm requires adjudication by a CBP officer; consuming a tremendous number of labor hours annually. By greatly reducing these non-threatening alarms, the number of CBP officers required for RPM operations is substantially decreased allowing the officers to conduct other important security and trade facilitation duties. Reducing RPM nuisance alarms also benefits trade by improving the flow of commerce through the ports and reducing the idle time commercial truck drivers experience while CBP officers conduct alarm adjudication procedures. "The Revised Operational Settings approach is based on data analytics techniques utilizing the analysis of the unique characteristics of each specific radiation portal monitor deployed and the type of cargo that goes through it," said Sonya Bowyer, a physicist at PNNL. "This allows the ROS analysis team at PNNL to generate potential benefits at various operational settings and present those alternatives to CBP for their selection. Once an alternative has been selected for a specific radiation portal monitor, the new revised operational settings are implemented during the annual calibration of that radiation portal monitor." Since PNNL also conducts the calibrations of all radiation portal monitors annually for CBP, seamless coordination and efficient implementation of ROS has been achieved. Prior to the implementation of ROS, RPMs were typically calibrated to universal settings with emphasis for threat detection on the total amount of radiation detected. By adopting the new Revised Operational Settings approach, which emphasizes the use of the more selective energy-sensitive alarm algorithms and is based on individual RPM specific analyses, PNNL is assisting CBP in making significant advances in operating its fleet of RPMs with greater efficiency and effectiveness at our nation's ports of entry.